Here's a scene from Mary Ellen Bute's wonderful film 'Passages from James Joyce's Finnegans Wake', which you can see on youtube and ubuweb. 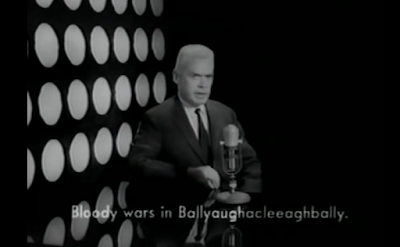 Bute needed to find ways of visualising Joyce's text, and one of them was to re-invent the Wake narrator as a television newsreader. It might seem that she's taking liberties here, but television is in Joyce's book. The 'Stories' chapter (p309-82) is set in a pub, based on the Mullingar House in Chapelizod, which I visited in 2013 and which has this plaque on the wall. 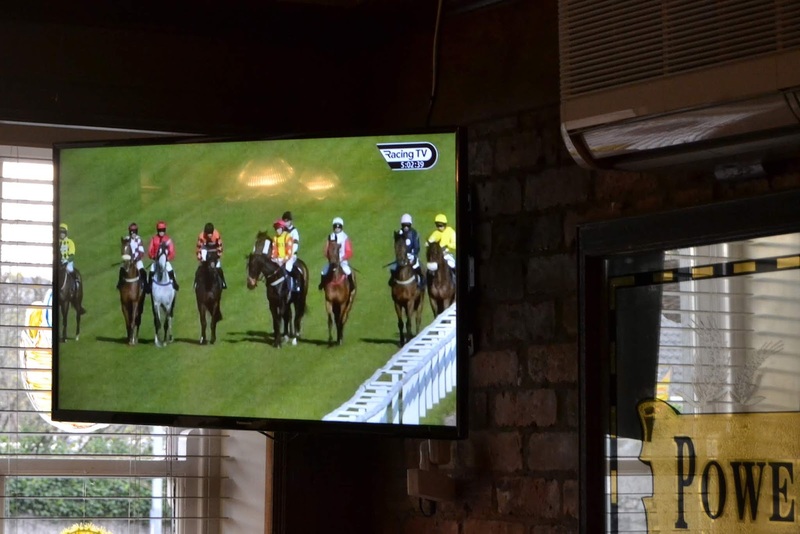 The extraordinary thing about the Wake pub is that it has a television set! 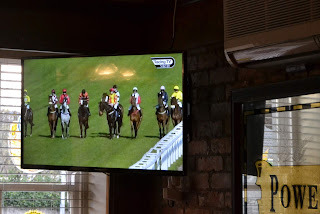 If you travelled back to the Mullingar House in 1938, when the chapter was written, and told Mr Keenan, the landlord, that one day his pub would have a television, he would surely have dismissed the idea as science fiction. 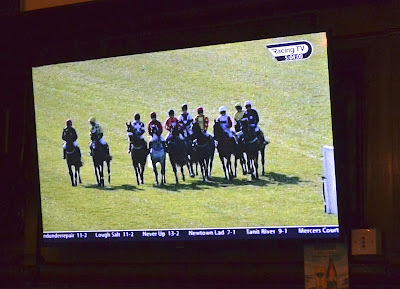 But I can confirm that it really now does have television – three sets, showing sporting events. Finnegans Wake has the power to predict the future! Robert Anton Wilson from an interview transcribed by Scott McKinney and published in 2012 on the OnlyMaybe blog. This is an astonishing account of the working of television, merged with the Crimean War. 'Charge of a light barricade' combines beams of light firing at the 'bombardment screen' with the Light Brigade charging the Russian guns at Balaclava. You can imagine how Joyce's imagination took off at the name 'Light Brigade'! 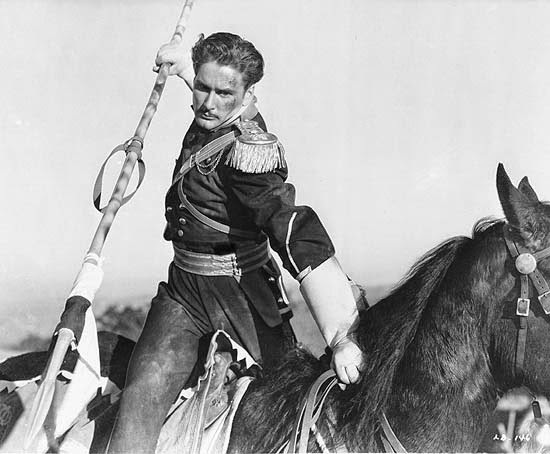 Here's Erroll Flynn in the 1936 film, 'Charge of the Light Brigade'. If you've ever seen this on television, you will have experienced both the beams of light and the charging cavalrymen simultaneously. I wonder if Joyce saw this film, released just two years before his own Crimean War treatment. 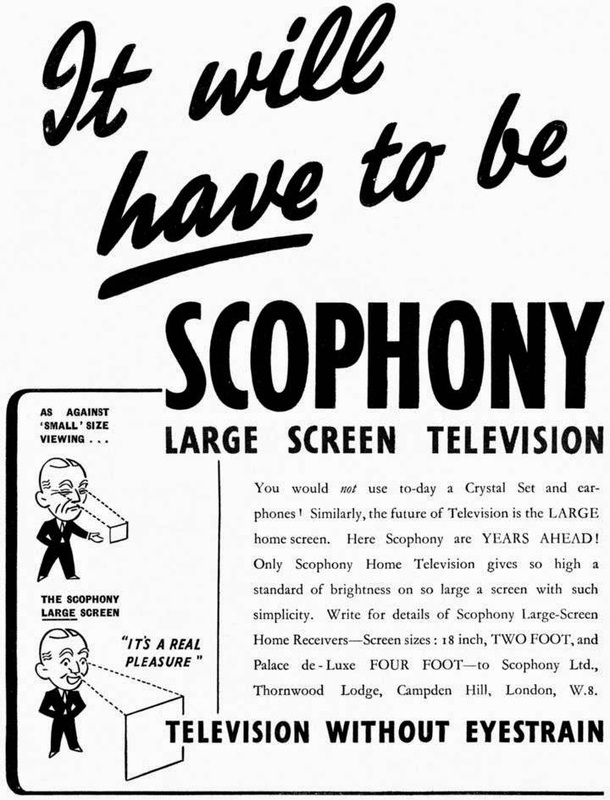 There's also a religious dimension to Joyce's text, suggested by the word 'iconoscope', a technical television term, from the Greek eikon (image) and skopon (to watch). The General's appearance on the screen is like that of a Saint from an Icon, or a Spectre - 'idolon' is from the Greek eidolon - spectre - which also gives us 'idol' . This all suggests the miraculous impact of early television. 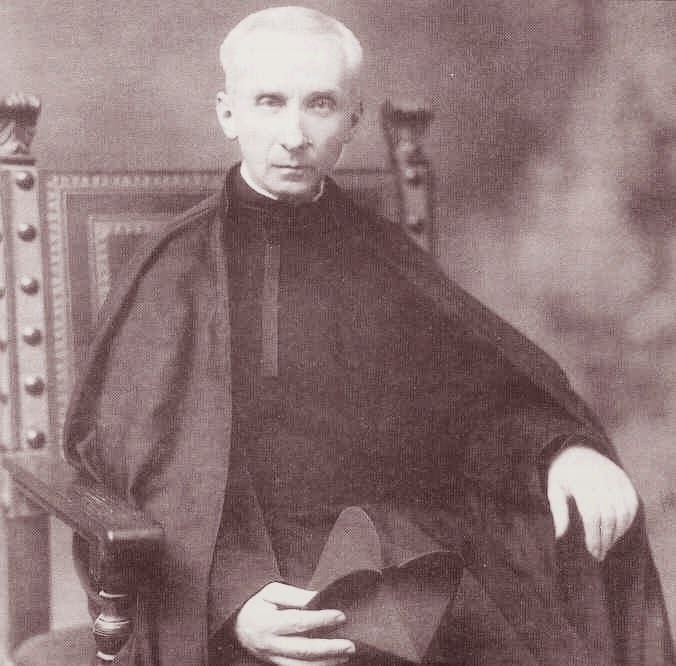 To Joyce, with his Jesuit education, 'General' would recall the Superior General of the Society of Jesus, nicknamed the 'Black Pope'. Between 1915 and 1942, this was Wlodimir Ledóchowski (right). So Joyce calls his General 'Popey O’Donoshough, the jesuneral of the russuates', and describes him wearing various religious seals. 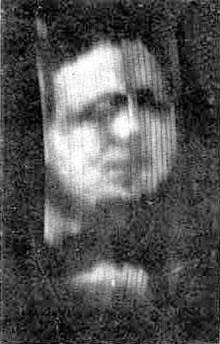 'Bairdboard' is named after John Logie Baird, who transmitted the first television images in 1925. This is the first known photograph of a moving image produced by Baird's 'televisor', in around 1926. It shows his business partner Oliver Hutchinson. This is how I picture Joyce's Russian General emerging, like a spectre, on the screen of the Mullingar House television. Television will replace the telephone, for our eyes demand their turn, after our ears. I think one reason that Joyce was interested in television was that it was a new technology which required new words. 'Television' itself combines the Greek 'tēle' (far) and the Latin 'visio' (seeing). It's almost a Wake word! In the passage above, Joyce has come up with his own alternative, 'faroscope', meaning 'far seer' (Greek 'skopon' again). It also has the special Wake echo of the 'fire escape' in Medina Place, Hove, used by Charles Stewart Parnell to escape from being caught with Kitty O'Shea (cf 'a skyerscape' 4.36; 'fuyerescaper! 228.29; 'fairescapading in his natsirt' 388.03). There's also 'Pharos', the Greek lighthouse. Imagine if the television pioneers had been Joyce fans. Along with the physicists' 'quark', adopted from Finnegans Wake by Murray Gell-Man, we might today talk about what we saw last night on our faroscopes rather than our televisions. 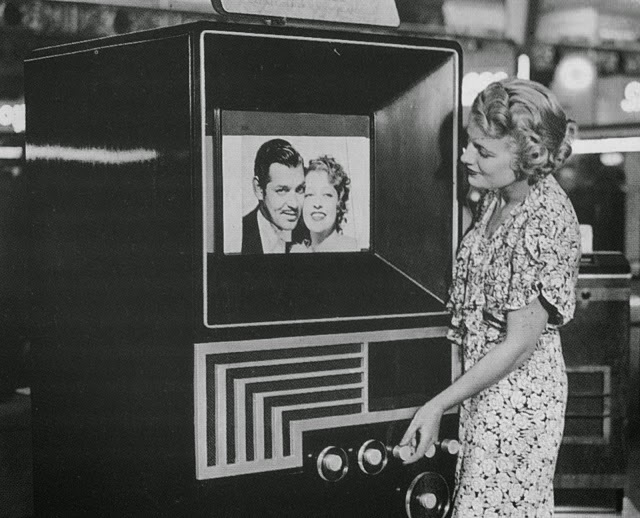 The 1930s saw big leaps forward, with electronic television improving on Baird's mechanical system. 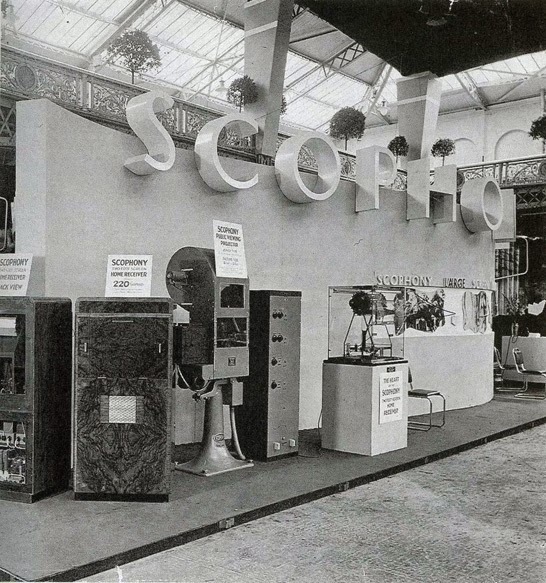 This was the work of many inventors, but the most important was probably Vladimir Zworykin, who invented and named the iconoscope, the first practical television camera tube. Again, there's the Battle of Balaclava here, as the Russian gunners traverse the British lines. 'sunksundered' is an echo of 'rode the six hundred', from Tennyson's 'Charge of the Light Brigade'. Here's a film, posted on youtube by The Shootingstar31, which explains this simply. 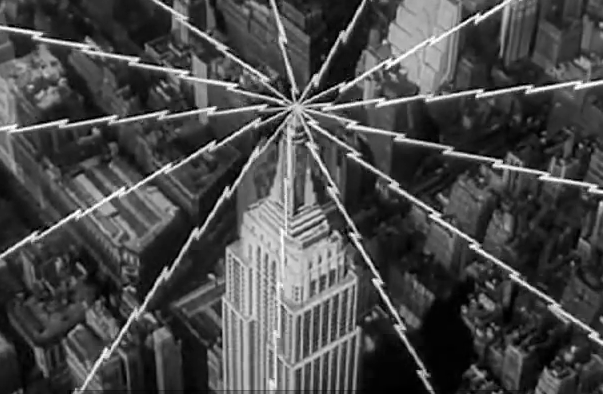 These signals were then picked up by radio receivers - tv aerials -and converted back into an electrical current, which was then amplified and used to create the image on the television screen. Synchronizing pulses added to the signal at the end of every scan line and teleframe ensured that the receiver remained locked in step with the transmitted signal ('Down the photoslope in syncopanc pulses'). 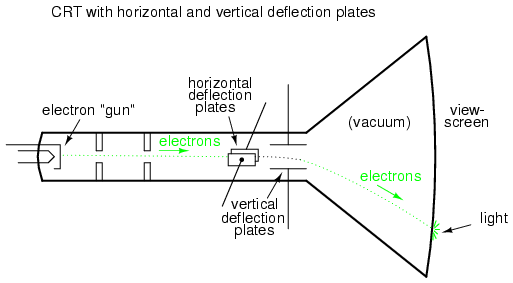 To convert the electrical current back into the original image ('its viseversion'), televisions used the Cathode Ray Tube, also named by Zworykin. This was a vacuum tube containing an electron or spray gun, which bombarded a flourescent screen with a narrow beam of electrons ('Spraygun rakes and splits them'). This caused the screen to glow, recreating the original teleframe. Its effect was to split the focus of the light ('splits them from a double focus'). Hell, something's gone wrong with the supersonic switch! The missing letters represent missing parts of the television image. A lot of the information above comes from Danis Rose, who transcribed Joyce's notes on television in his Index Manuscript, published by the Wake Newslitter Press in 1978. The Index Manuscript is a transcription of one of Joyce's last working notebooks, known as VI.B.46. Here are Joyce's notes, with page and line numbers added by Rose, showing where each item appears in the Wake. The letters 'G' and 'S' refer to the green and sienna coloured crayons which Joyce used to cross out each entry when he transferred it to his text. Tracking down Joyce's source is a job for the Genetic Wakeans! But it only became a reality in the 1920s. 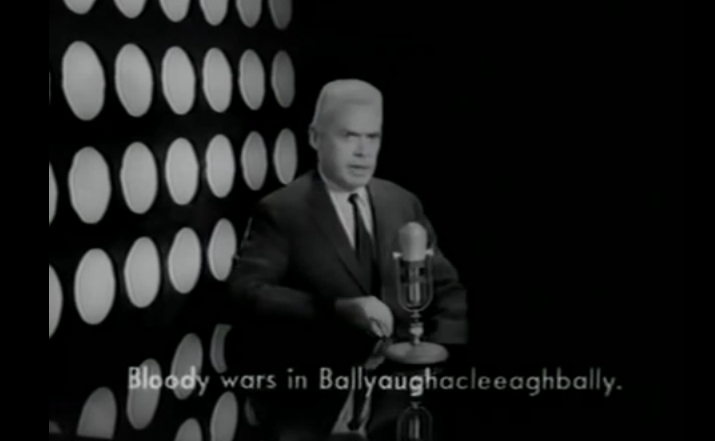 Frank McNally of the Irish Times discovered that there was a raechorse called Television in 1927, the same year that Joyce first used the term. Great post as ever, Pete! I suspect that "visevision" may be meant to evoke "TeleVISOR" which is what Baird always called his apparatus. Interestingly, the Wake was not the only book to predict television -- Stella Gibbons's Cold Comfort Farm (1932) has people talking and seeing each other via television phones!